All four of the inner city highrise buildings in a row, towering over the smaller buildings. This was shot in 2004 from the stairway to the old railway bridge, but it still looks the same today. The buildings were part of a huge city development project which had started in 1970 to build them together with a shopping center, a big department store and a multi-storey car park right next to the central train station. The construction began in 1971 and in 1973 two of the highrises were ready, while the shopping center was finished together with the third building in 1974. 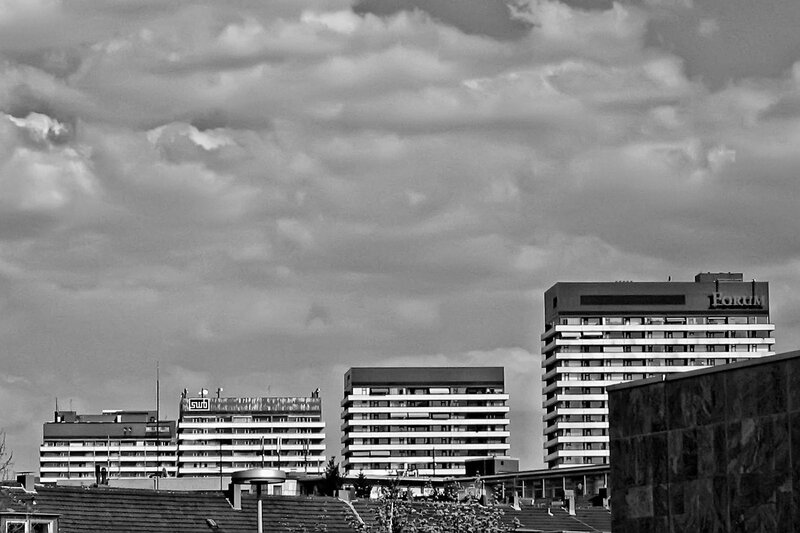 The last highrise – I think it’s the left one in this photo – was only built in 1977. More about them in the next photo tomorrow…ish.